How Buhari's Chief Of Staff Abba Kyari Capitalised On His (Buhari's) Memory Loss To Insert A Clause ''National Coordinator'' In Letter To Senate! 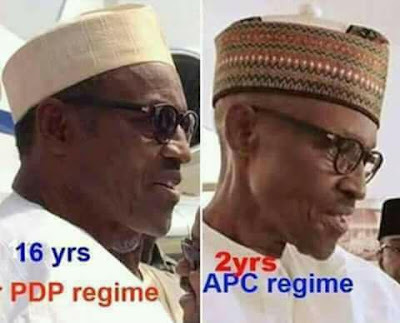 Presidential sources, on Thursday night, revealed to Sahara Reporters, that President Muhammadu Buhari, has often times suffered from memory loss when carrying out his Presidential duties. This revelation came against the backdrop of the controversial letter to the Senate, in which he referred to Vice President, Yemi Osinbajo, as the “National Coordinator”, instead of the “Acting President”. Sources accused the Chief of Staff, Abba Kyari, for capitalizing on Buhari’s illness, to insert a controversial clause in the letter that was sent to the National Assembly. “The Nigerian President, who is officially 74 years old, is believed by some to be older and to be plagued by the usual ravages of old age, including a failing memory”, a highly placed Presidential source confided in Sahara Reporters. He added: “Buhari had on several occasions, scolded the Chief of Staff, for his mischievous maneuvers. “Mr. President has often sharply rebuked him, insisting that things must be done properly and constitutionally”, the source added. Another source said Buhari was irate on learning about the political fallout from the ill-motivated decision to alter the usual content of his letter to the National Assembly. The source asserted that the President signed the letter on Sunday, after a quick glance, with the understanding that the letter was couched the same way as the previous letter he signed when he went on an extended medical leave, last January. “I can assure you that he never knew of the ridiculous insertion of the word ‘Coordinating’ in his letter”, the source stressed. By doing so, emerging report revealed that Abba Kyari, the Chief of Staff to President Muhamamdu Buhari, indirectly designated himself as the Acting President, by intentionally inserting the clause “National Coordinator” referring to the Vice President, Yemi Osinbajo, in Buhari’s letter to the Senate, before Mr. President embarked on another medical vacation, last Sunday. Sahara Reporters reported that Kyari’s main goal in using the word “Coordinator”, tagged in the President’s letter to the National Assembly, was to retain considerable power and influence around his office and person, most especially when the President is not around.